A very important part of the Energic Ets Patissier branding is the “Demonstration day”. Where agents and the factory invite prospective customers, existing customers and the press to evaluate and watch machinery demonstrations. The earliest I have on record is in May 1934 at Avignon (see below) demonstrating the Energic motoculteur C7 B4L is eager on lookers. 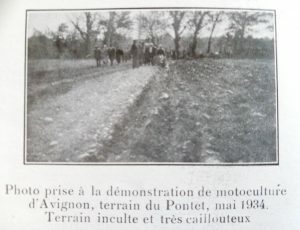 Energic demonstration of motoculteurs at Avignon, on the land of Pontet in May 1934 The land is inclined and stoney!